The next game we'll be taking a look at was runner-up to LocoRoco 2 for best PSP game of 2009 right here on SPC. We're finally covering it now. 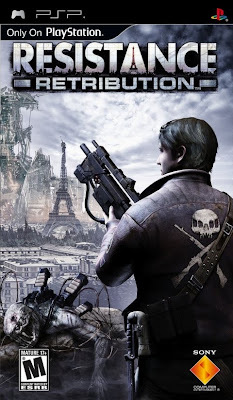 It's Resistance: Retribution for the PlayStation Portable, and the review starts now. 2009 seemed to be the year of bringing PlayStation 3 properties to the PlayStation Portable. There was Little Big Planet and Motorstorm, but first was the Resistance franchise. 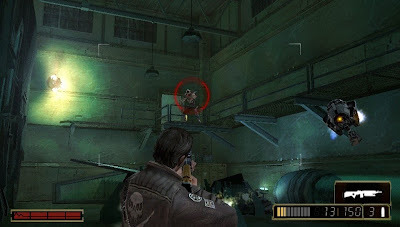 Changing things up by playing in a third-person perspective, Sony Bend, makers of both Syphon Filter PSP games has created yet another exciting PSP installment for owners of the handheld to go ga-ga over. The result of their determination is Resistance: Retribution, and boy, is it good. Resistance: Retribution takes place between the original Resistance and Resistance 2. The European continent is nearly controlled solely by the monstrous Chimera. You play as James Grayson, a soldier who helplessly watched his brother become converted into a Chimera. Now donning his brother's jacket, Grayson vows to put an end to the Chimera's conversion centers by destroying each and every one even if it kills him. The story of Retribution plays out in still-frame cutscenes narrated by one of Grayson's superiors. There's enough twists and turns to make the story bearable and even a bit intriguing. You can't help but root for Grayson and his abrasive personality. Tools of the trade: the shotgun is deadly up-close. The story plays out through over twenty missions of varying length and difficulty. Unlike the console versions, Resistance: Retribution plays out in a third-person perspective. Gameplay consists of running through hallways and rooms, finding cover, blasting baddies from cover, and moving onto the next firefight. This is just as simplified explanation of what goes on in Retribution as there's plenty of variety in the gameplay. From swimming in underwater facilities to mashing the X button to pull down levers to taking control of mega mechs and gatling guns, Resistance: Retribution keeps players on their toes. James Grayson isn't alone in his mission thankfully as he has enough firepower and health packs lying around levels to do in the Chimera's fierce forces. Each weapon has a primary and secondary fire function. The Storm Rifle doubles as a grenade launcher while the machine gun Razor gets its name from launching a giant pulsating blade at enemies. Other weapons return from the Resistance franchise such as the sniper rifle Fareye which can slow down time for marksmen to get their perfect shot, the LAARK rocket launcher can take down larger enemies with ease, and the Auger's bullets can shoot through walls and objects, even creating a bullet barrier for a limited time. Case in point, if you want high-powered weaponry, you'll get it in Resistance: Retribution. Aim assist helps this game not be overly challenging. And Grayson will need all these weapons to take out the multitude of enemies the Chimera throw at him. 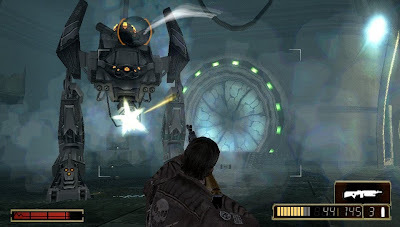 There's giant beasts with rocket launchers, small jumping creatures known as leapers which will plant themselves on Grayson's face and attack, Chimera that utilize a multitude of weaponry such as Augers and chainguns, hovering robots that aren't so shy about shooting at James, female Chimera that will march towards James and explode when they get close enough to him, as well as massive boss creatures for our hero to take on. These boss battles occur in expansive arena settings sometimes pitting James against two large creatures or machines at a time. Two against one? I like these odds. Controlling James Grayson is a breeze. You use the analog nub to move around and the face buttons to look around-- sort of like a dual-analog control setup but not quite. The d-pad is used to manually aim, select weapons, and access many input sensitive commands such as pressing switches and pulling levers. The cover system works quite well. You just run or walk up to a wall or section of fence, and you automatically cover behind it. Unlike something like Gears of War, there's no accidentally running up to cover when you don't want to. The game's much smarter about that. Aim assist is used, and it's based on the enemy you're looking straight at. It helps, and it definitely does not detract from the experience at all. Overall, the controls feel tight and responsive for sure. 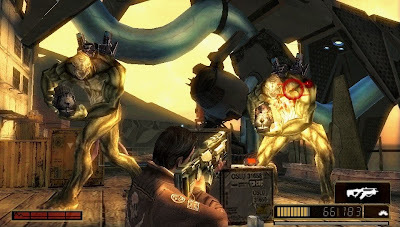 The single-player portion of Resistance: Retribution takes about six or seven hours to complete. There's multiple difficulties some for novices and some for veteran Resistance players. In addition to these modes, there's several intel hidden throughout the game's levels placed in out-of-the-way locations. Collecting these will unlock new weapons to use such as a powerful magnum with exploding bullets. Each level also has three skill points to earn. These range from destroying three enemies with one flammable barrel to surviving a boss battle for a set period of time. These bonuses extend the playtime of the game by a wide margin, so there's plenty of content in this game. This massive mech will take more than that gun, James! What also extends the playtime is the terrific multi-player mode. You can choose from one of three modes with up to seven other players fighting alongside you or against you. There's your standard deathmatch mode, but there's also two unique modes. The first is where you capture the opposition's node while protecting your own for points. The other is a seven on one engagement where one player is a powerful Cloven and the others are on the Marquis side (the heroic side). The object is to eliminate all of one side of the team. The catch is that when a Cloven kills someone, that player also turns into a Cloven. Lag is nothing but an imaginary word when playing online-- it just doesn't happen. Add in the fact that everyone has a mic to chat with online, and you have some excellent online multi-player for a handheld. 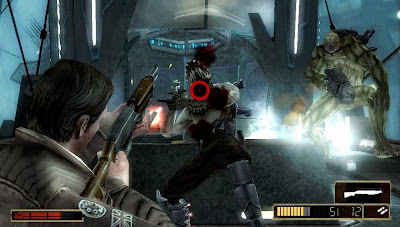 Resistance: Retribution is one of my the most technically impressive PSP games ever put together. The framerate is solid, the characters look well done and animate beautifully, and the levels are designed brilliantly. The music on the other hand is mostly forgettable, but the voice acting steps up and is wonderful. You might recognize James Grayson's voice actor as a little known character known as Travis Touchdown from No More Heroes. Both characters have the mouth of a sailor. Overall. Resistance: Retribution isn't just one of the best PSP games of 2009, it's one of the best experiences on the PlayStation Portable completely. It handles well, it plays great, and it's full of interesting set pieces and dynamic action with a wonderful story to boot. Let's not leave out the crazy fun multi-player either. Those looking for some excellent exciting third-person shooting gameplay on a handheld should definitely check out Resistance: Retribution. Ah... the great blue yonder. I would like to thank the Wright Brothers for making the following game possible. Without them, we'd still be battling in tanks, and this next reviewed game would be called the Tank Crawlers instead of what it really is, The Sky Crawlers: Innocent Aces. Crawling in My Sky, These Wounds Will Not Heal. Who hasn't dreamed of flying high in the sky-- passing through clouds and soaring among the stars and sky? Well, if you can't charter a plane and lack a pilot's license, you can always enter the flight simulation department with some video games. 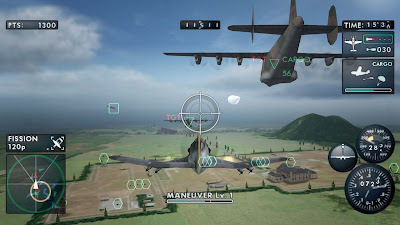 Recently, XSeed and Namco-Bandai along with Project Aces, the team behind the Ace Combat games, have partnered up to create a new flight combat game utilizing the Wii's unique controls. The end result? 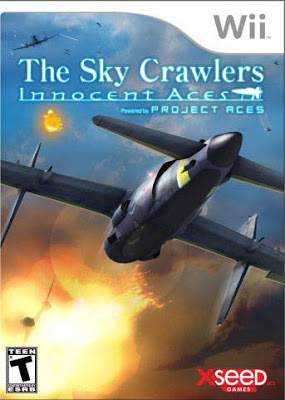 The Sky Crawlers: Innocent Aces for the Nintendo Wii. Does this flight combat game soar high or crash and burn? with the blood of your enemies. War is common on Earth these days, but in Innocent Aces it's not between countries. This war is between two rival companies of all things. You play as Lynx, a new pilot with the Cheetah Brigade. You fly along some rather annoying characters such as the whiny girl who always cries about wanting to fight, some adolescent boys, and the token douche. The video game is a companion piece to the feature-length animated movie simply entitled, The Sky Crawlers. You need not watch the movie to understand the plot though it certainly doesn't hurt. Production I.G. handles all of the game's beautiful hand-drawn cinematics, and each mission is bookend-ed by a briefing and congratulatory speech after battle. These animated scenes are quite pleasant to watch. Innocent Aces utilizes a lot of varied mission types to keep the game fresh and lively. One mission you'll simply be taking out all enemy targets while another will have you defending a base or weapon against enemy attacks. There's nineteen mission in total to tackle, and I'd be lying if I said the difficulty was even. One mission may be relatively difficult while the next is a breeze to beat. This is especially so in missions when piloting the Senryu airplane-- a craft with horrible maneuverability. There is this one mission where you have to help your squadmates in picking off the attackers pursuing them. This is a limited time engagement, and the time restrictions are so strict that the mission is next to impossible. I haven't even mentioned yet that you're forced to pilot the Senryu. It makes for an effort in frustration, and that's but the ninth or so mission. The following missions are a cakewalk in comparison, so that's what I mean by uneven difficulty. Ah, the Senryu, my mortal enemy. There's multiple control options available to players when they start up Innocent Aces. The Wii remote and nunchuk combination is the most entertaining. You hold the Wii remote in your left hand (it really doesn't matter), and you use that as your throttle. You hold up to speed up and hold down to slow down funnily enough. Meanwhile, you use the nunchuk to control the direction of your craft's flight. This might seem too gimmicky, but it is a novel approach to flight control. Of course, if you're like me, being novel isn't enough. I need to know I'm in control of my plane, so that's why I stuck with the Gamecube and Classic controller options. Everything is much tighter and responsive with the Gamecube or Classic controllers especially in those anger-inducing Senryu stages. In flight, you have a myriad of maneuvers and tricks at your disposal. Each plane has a secondary fire that can be used such as land bombs, rapid fire machine guns, and missile launchers. Unlike your primary fire, secondary fire does not have infinite ammo to use and squander, so aim true and make those shots count, captain. 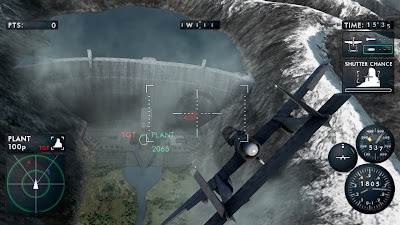 As you approach an enemy plane, a gauge on the bottom portion of the screen will rise. The more it rises, the higher the chance you'll be able to perform a successful TMC or Tactical Maneuver Command. These moves place you directly behind the currently-viewed enemy fighter for you to blast them out of the sky with ease. There's also a variety of rolls and loops that can be performed to get enemies off your tail in a fast fashion or to make a turn quickly. especially when trying for a TMC. There's around six different planes available to players in Innocent Aces, each with their own stats and abilities. You can customize any plane from engine size to secondary weapon to paint job at your leisure. As you complete missions with good marks, you unlock even more options to outfit your soaring eagles with. With three difficulties each with different grades awarded to them, you'll be playing Innocent Aces long after the five hours to beat the game are up. Innocent Aces is a gorgeous-looking game. Everything runs smoothly without a hint of a framerate drop Meanwhile, the planes and other combat vehicles are designed and rendered well, and the backdrops are probably the most impressive aspect of Sky Crawlers' visual appeal from intensely beautiful sunsets to the landscape viewed from above. On the sound side of Sky Crawlers, the intense dogfighting is complemented by banter from your comrades as well as enemy forces sort of like a more realistic Star Fox 64. The music is some of the best so far this year with catchy and infectious new-age orchestral music composed by Nakamura Kazuhiro, a new composer who has previously done work on the Tales Of franchise. If you can get by the uneven difficulty and the occasional frustrating mission, The Sky Crawlers: Innocent Aces is an excellent thirty dollar investment. 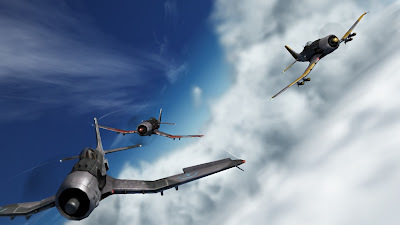 The sense of flight is terrific, the dogfighting is intense and incredible, and the game really is fun to play regardless of what control setup you choose. Without a doubt, this is one of my biggest surprises of the year thus far. If you're looking to soar like an eagle and sometimes crash like a lead balloon, The Sky Crawlers: Innocent Aces may just be the next Wii game for you. I've talked about ModNation Racers for the PlayStation 3 a bunch already, but it turns out that a PSP version is driving its way to store shelves at the same time as the PS3 installment. Just like its big brother, the PSP version allows for creation of your own tracks, racing online with friends or strangers, and a robust array of options available. Catch both versions of ModNation Racers sometime this year hopefully. Perfect Dark is basically the only reason I want to get a new 360. I won't lie, I won't pretend not to be biased when I'm obviously not. I don't like the 360 as a gaming platform. However, the greatness comes from a select few companies and avenues such as Xbox Live Arcade. Here's a visual walkthrough of the first level and the free commentary by Ken Lobb (Goldeneye's Klobb was named after him). Perfect Dark will come out this March for $10 or 800 points. It's another month at NPD, so it's time for them to unveil what systems and games broke through to the other side of the sales wall with January's NPD results. Without further ado, here they are with bonus commentary by yours truly. Mass Effect 2 debuts solidly, and you can probably add one sale for the 360 next month due to the fact that ours died... Regardless, New Super Mario Bros. Wii impressively comes out as software king this past January. Could Reggie Fils-Amie's prediction of NSMB Wii outselling Call of Duty: Modern Warfare 2 come to fruition? Looks that way to me. Meanwhile old favorites such as Wii Sports Resort, Wii Fit Plus, and Mario Kart Wii lay siege to the top ten. Newcomers such as the excellent Darksiders, Army of Two: The 40th Day, and Just Dance make up the last part of the top ten. On the system side of things, it looks like the PlayStation 2 is almost set for retirement after ten magnificent years. The Wii and DS once again are on top this month (yawn) while the 360 and PS3 do some mighty fine sales, too. A pretty boring month actually, but after the month that was December-- aka salesmageddon-- that is to be expected. This thirteen episode series is one total mind-screw. You think you know what's going on, but then boom! Some new plot element happens from nowhere that changes your perception of the series. The series follows the story of a mysterious attacker who uses a golden bat to knock people's troubles away. He preys desperate people, and now many citizens of Tokyo find "Lil Slugger" as a messiah, a way to escape their problems. 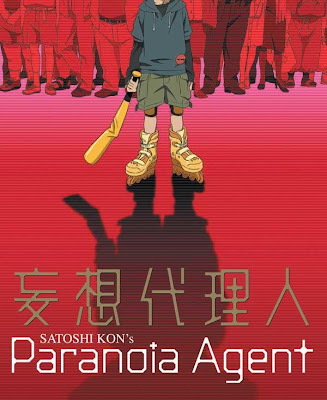 Part thriller, part satire, all attitude, Paranoia Agent is a confusing anime that will keep you guessing until the series' crazy conclusion. This anime is known as Detective Conan in Japan, and it has run over 300 episodes thus far with multiple movies and games released. It's a mystery show with a twist-- all of the cases are solved by a teenager trapped in a little boy's body. Confused? Don't be. It creates some hilarious situations as the bumbling old detective who's with Conan usually solves the case with unnoticeable help from Conan. It's always a blast to solve a crime and noticing what went awry at the crime scene or which suspect isn't telling the entire story. 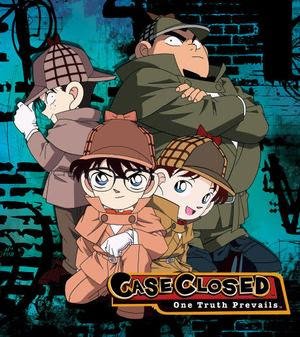 If you love Sir Arthur Conan Doyle's mystery novels or love a good mystery yourself, check out Case Closed where only one truth prevails! Who doesn't love giant robots? Did you know chicks dig giant robots? I heard that from someone smart. 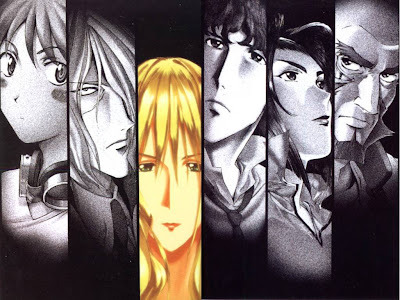 Gundam Wing follows a global war with the mysterious OZ corporation in the middle. It's your typical Gundam Japanese soap opera with giant mobile suits fighting the wars. There's five Gundam pilots in all, each with their own themed Gundam. Labeled as mercenaries by many, united as one they have one goal-- to stop OZ. With intense action, fifty-plus episodes, a great soundtrack composed by Kou Otani of Shadow of the Colossus and Outlaw Star fame, and plenty of thrills and chills for anime fans. 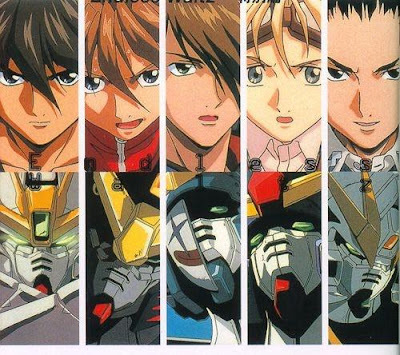 If you're tired of your wars being realistic, check out Gundam Wing. When a human transmutation to revive their dead mother goes wrong, brothers Edward and Alphonse Elric lose something dear to them. Ed loses his arm and leg while Al lost his entire body. His soul is now attached to a heavy suit of armor. The two promise each other to get back their bodies, go after the Philosopher's Stone, and learn from their mistakes. Funny at times, warm at times, gravely depressing others, Fullmetal Alchemist is an entertaining anime unlike any other. The soundtrack by Michiru Oshima covers a variety of moods and scenarios with her epic orchestral score. 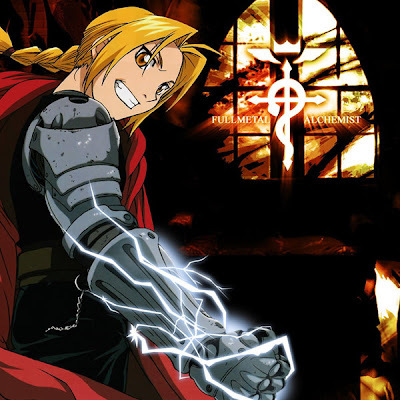 Full of action, drama, and heart, Fullmetal Alchemist uses alchemy to draw up the number two spot. One ship, one crew, four souls, four destinies, one awesome show with the best anime soundtrack ever composed by the best composer ever, Yoko Kanno. 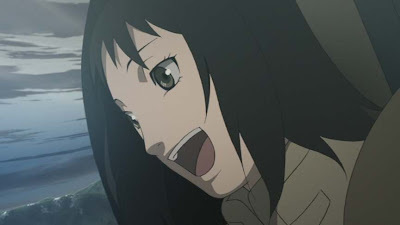 Unlike most of the other shows on this list, this anime is purely episodic with a recurring theme that pops up occasionally in five of the twenty-six episodes. This was the first anime to make me cry with Fullmetal Alchemist being the second. Those who have watched from beginning to end know what I'm talking about. The show does a great job of conveying a story without pounding it into the viewer. Instead the show is much more subtle about how it handles situations and its narrative. Combine all this with a fantastic soundtrack full of every type of music imaginable from jazz to heavy metal, rap to rock, Cowboy Bebop has every anime beat. It's not just entertaining for otaku either. My mom sat down and loved this show, and she cried her heart out, too. Other Favorties Include: Yuyu Hakusho, Outlaw Star, Sailor Moon, Ghost in the Shell: Stand Alone Complex, S-Cry-Ed, and G Gundam. Love is in the air, and welcome to another week of soothing and wonderful VGMs from yours truly. This week we have The Legend of Zelda: Spirit Tracks, two Kirby games, and Super Mario Kart. A great mix of Nintendo-themed tunes to start off your week. Bon appetite! What could be called the main theme of Spirit Tracks, this song plays as you navigate the forest realm on your trusty train. After hearing the soundtrack to Phantom Hourglass, I was worried as to how the soundtrack of Spirit Tracks would sound. Thankfully, the difference is night and day. What a fantastic soundtrack for a fantastic game. Fraaz is the second temple's boss in The Legend of Zelda: Spirit Tracks. As always, the special item acquired in the temple will usually help you in falling the boss. Fraaz is no exception. This boss theme and various versions can be heard throughout the game's fights, but this one is my personal pick of perfection. I recently picked up Kirby's Dream Land 3 on the Wii Virtual Console. I'm really digging the game. It's got fun co-op, so I can play with family members. The music isn't too shabby either. The track I've selected to represent this game for now plays during one of the levels of Ripple Field. Kirby 64: The Crystal Shards was played by me for the first time thanks to the Wii's Virtual Console. There's a lot of great classics on there-- that's for sure. Some are overpriced, however... Nonetheless, this theme plays during the outside levels of Rock Star (aka Horobita Star in Japan). I recently went back to Super Mario Kart since it appeared on the Wii's Virtual Console. Boy, do I stink at it! Perhaps I'm too used to the physics of more modern kart racers. Regardless, this theme plays during the fun and crazy battle mode. Hence why it's called Battle Mode! We'll catch you next week for five more of SuperPhillip's Favorite VGMs. I hope you'll look forward to it as I will.